This post is apt to seem weird to some of you. As we looked for a home, I felt like God dropped a thought into my spirit. "Build a sanctuary for me." 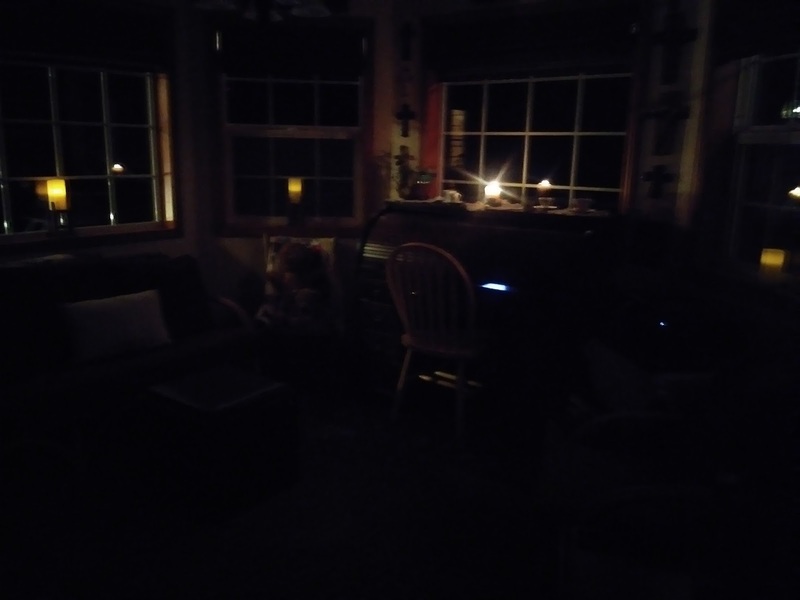 I did a topical study on sanctuary; complete with word studies and cross references. Yes, I felt I was to look for a home that would have a space for me to build a Sanctuary....not in a legalistic way. I recognize God's presence is everywhere - but still I wanted a physical spot dedicated to meet with God, filled with rest, a place to study, a place to encourage others - it would also serve as my spiritual "war room." I envisioned it as a place bathed in prayer and adoration, a welcoming spot. I envisioned others in the family drawn to the space. Obviously, in the 6,000 SF home we put an offer on, there were a zillion options for this space. But here, in this home we bought, there was a "nook." It's off the kitchen. It has a pantry in it. When we visited the home, there was nothing but a high chair in the nook. I knew it was my sanctuary space. One, it's open and I don't like being in closed space. The room is lined with windows - and I like light. It turned out everyone had thoughts of how the room should be used. It should be game room, an office, a play room for the grands....the list went on. I shared with Michael what I was thinking and he immediately said, that sounds right. Recently, we acquired a new-to-us desk top and printer. The study is small - actually it sits below the nook. Michael suggested moving the desk down there (gift from Mom G) up to the nook, along with a printer. I've learned not to say, "NO," immediately. I took a few days to think about it...to pray about it....and in the end, I agreed. I've not mentioned it much, but I'm having more and more trouble with my hands. Some days I can't hold a pen to write without my knuckles dislocating as I write. Some days I can't hold the pen. 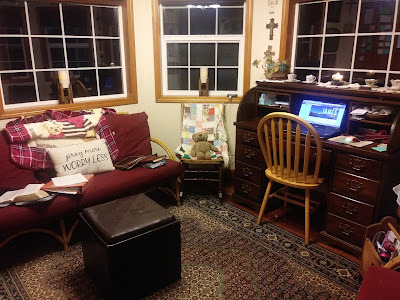 ::snort:: I think it will be good for me to be able to do my Bible study on the lap top....and it does take care of the problem of having files up and down stairs....I'm not thrilled with a printer in the nook - but it works. 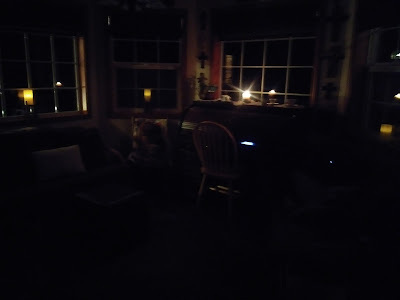 No one refers to the room as our Sanctuary Space...it's Mom's nook or the nook.....and I do love finding various ones drawn to stop by the nook. 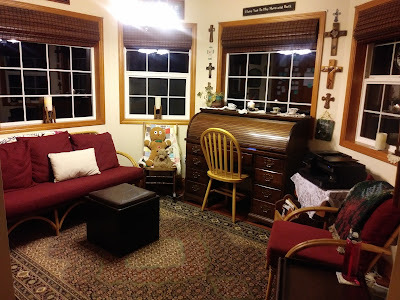 We have had some nice conversations in here, I do feel the room is special in some way....I suspect, as God's presence is EVERYWHERE in our home, that mostly it feels special as it reminds ME that His presences is everywhere...and that we are consciously building a sanctuary for HIM - not just a calm place for us. His purposes. His way. Today, the boys brought the desk up. We moved one of Krista's end tables (a gift from Mom G) down to the study. The other one is covered with a lace cloth mom had sent up in June and the printer. As you continue looking around the room - this is the next section. It is taken standing in the tea area. It is working really well for Bible study. I especially like having the laptop right here because after study, the next stop is to check in with Bible Babes - a virtual study group. Lest anyone think I'm really scholarly, the Bible and my notebook are there - the other books are my personal journal and my bullet journal. 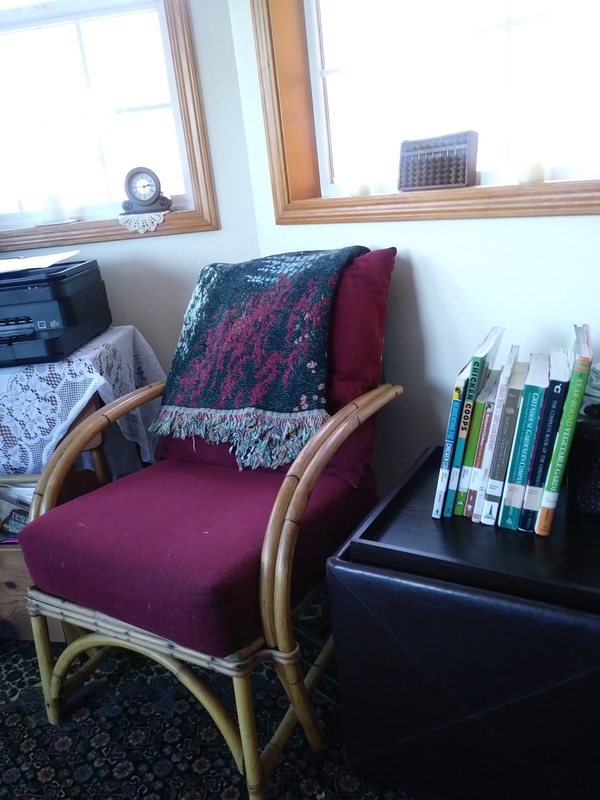 To the right of the desk is another chair and that ottoman is left as a table....which currently houses library books on greenhouses and chicken coops. It wasn't supposed to work out this way, but many of my favorite things are in here. My tea cup collection, all the furniture is from Mom or Mom G, things on the wall were gifts or made by the kids and my two antique photos are in here too. This is a very relaxing and restful space. 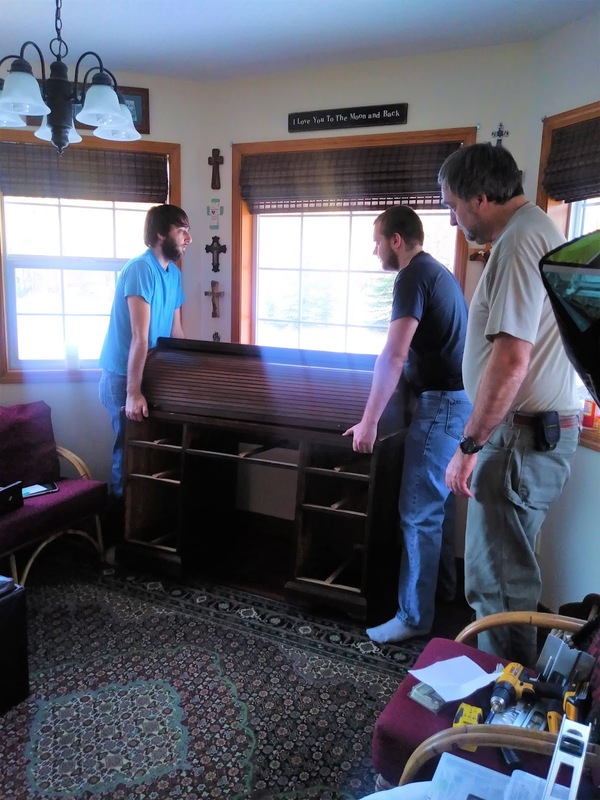 The rest of the story: We invited the original builders of the house over a few weeks ago. We found him when trying to locate a 2nd septic vault the owners we bought it from said existed. It doesn't. But we enjoyed getting to meet Wayne and Cynthia. We had a great time swapping life stories. They have 10 children. They lived in the basement while they built the upstairs. 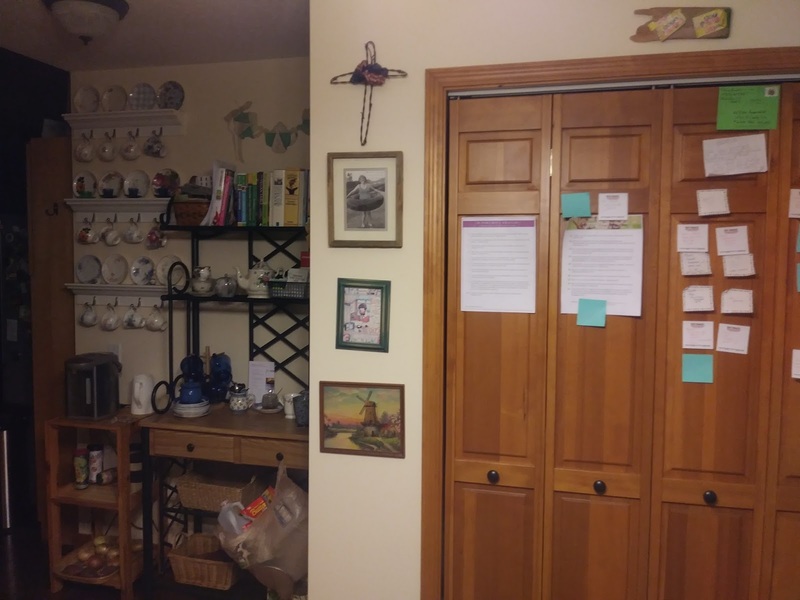 The tiles are laid out in the basement in one of Cynthia's favorite quilt patterns. Wayne shared stories with Michael, and info about the house, Cynthia and I shared more of the personal stories....We discovered we have a giant driveway because they often hosted church fellowships here. The nook was built to be an eating area for kids when they entertained. Wayne said he wasn't sure why he changed the shape of the room and put all the windows in.....I know why. I love it. God was looking down the road. ::wink:: It was a blast to get to spend time with them and learn more about the place.